Photographing from airplanes isn’t something that’s new for me. In fact, the first post I ever made for this blog featured my setup of a wing-mounted camera on a Cessna 172 Skyhawk. In 2010 while working for the New Castle Courier-Times, I had the opportunity to make photos while in a biplane. This proved to be challenging. I had to hold my camera over my head in the very strong winds and shoot blindly behind me. Last year, I went up in a Cessna to photograph downtown Rockford at sunrise. Timing the sunrise was everything. I had the plane’s window open which made it rather chilly and windy in the aircraft. But none of those challenges come close to what I experienced earlier this month. 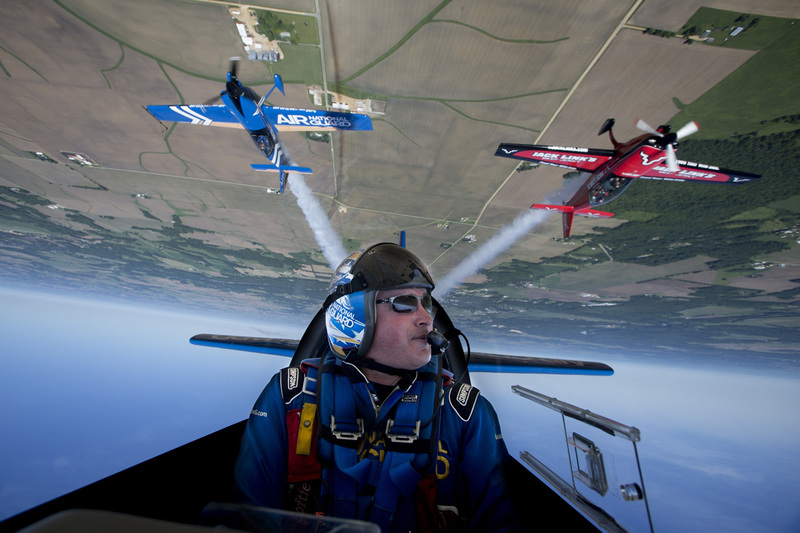 A few days before the Rockford AirFest, I had the opportunity to go up in an Extra 300L aerobatic aircraft with the Air National Guard aerobatic team. I consider myself to have a rock solid stomach. I never get any sort of motion sickness. I still took the advice of not eating much before the flight. The morning of the flight, I was really amped up. I got to the airport early to get a sense of how I was going to make my picture. The idea in mind was that I would be in the lead aircraft. We would then flip upside down while two other aircraft closed in on us. I would once again have to take pictures blindly behind me head. Initially, this seems like it would be much easier this time around compared to the biplane. This time, there is no wind. I’m in a closed aircraft with a glass canopy. However, that wasn’t the case. The three planes took off from the Chicago Rockford International Airport and headed southwest over farmland. I was very firmly strapped in, and strapped to me was a parachute. Once we reached an area far away enough from the airport, the pilot, Lt. Col. John Klatt, told me we were going to do a test roll. We did and my mind was blown. I was overwhelmed with adrenaline and disorientation. There I was hanging upside down looking straight at the ground. After our test roll, I tightened my belt a click or two tighter (the seatbelt uses a ratchet system). We did a few runs and I fired off hundreds of frames. Here was the one I settled on. After we got the shot, the pilot went into a series of loops and spins. I couldn’t tell which way we were facing. The skin on my face felt like it was being peeled off. It was incredible. The forces were so strong, I thought it was best just to hold onto my camera in my lap at that point. I’m not going to lie. My stomach did start feeling a little funny on the flight back to the airport. I kept everything in my stomach, but the flight did push me to the limit. The aircraft was already outfitted with two GoPro cameras. One was inside facing me (not as exciting of an angle as it sounds) and it was recording the audio from the headsets. The other was mounted on the wing. The team was gracious enough to provide me with the video files from my flight so I could edit them into something for the paper’s website. I mixed it together with a few shots I did handheld on my DSLR. Needless to say, roller coasters are forever ruined for me. But if someone could set me up with a flight in fighter jet, I’d be all over that opportunity! I got queasy and panicky just reading your descriptions! But not so freaked out I couldn’t appreciate the pix. Haha! Glad you appreciated them. I’d do it again, even if I knew I was going to make a mess of the cockpit. Such a unique sensation.